Baking soda is a very versatile ingredient that is most famous for baking and coking. A lot of people use this powder for many DIY housecleaners because soda comes very cheap and it is actually very effective. At that cost baking soda can serve you as so much more that the regular cleaning agent and it comes without chemicals and no danger to the health. There are some other uses for baking soda other than cleaning and cooking and they can really help you treat some issues and areas in the body. Baking soda has alkaline properties and that makes it a great solution for bee and wasp stings. These alkaline properties will draw out the contaminant of the wound and fight acids. Make a paste out of baking soda and water and apply onto the afflicted area. The same simple mixture of water and baking soda can help a lot for drawing thing on the surface of the skin. For instance, splinters and similar problems. Mix baking soda and water to make a paste and rub it on your armpits. This will help you remove and prevent smell and sweating and without any harmful chemicals. When you have a sunburn in the summer days try taking a lukewarm bath with ½ cup of baking soda. After that try air drying and do not use the towel so that the soda particles stay on your body and heal the burned skin. 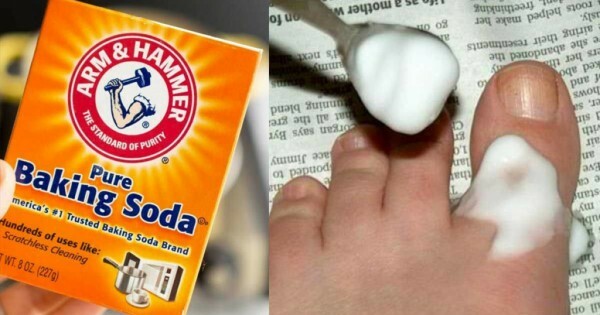 Baking soda is a great additive to a foot bath. Just add a little bit to it to achieve an energizing and relaxing effect. This will also soothe the skin of the feet. Adding baking soda to your shampoo can be beneficial because the baking soda is very powerful when it comes to cleaning and degreasing. The combination of shampoo and baking soda will make a great clean and healthy skin. You can soothe any stomach issue and discomfort with a mix of 1 teaspoon of baking soda and 1 cup of water. Drink this whenever you have stomach issues.